Kung fu is a traditional Chinese fighting art that combines unarmed offensive and defensive techniques with weapons. Like wushu, the term "kung fu" is used broadly to describe any type of traditional martial art developed in China. Although exact time frames might differ between styles, teachers and the individual student, it is generally considered uncommon to receive a black belt in kung fu in fewer than three years. The Shaolin Gung Fu Institute offers a philosophical answer to that common question: a student will receive his black belt when he is ready, and no sooner. This ultimately depends on the personal intention and dedication of the student as he increases his knowledge of the forms and techniques required for each grade level. Unlike Japanese martial arts, the ranks in kung fu sometimes are referred to as sashes instead of belts, and often progress in color from white to yellow to orange to blue to green to brown and eventually to black. Kung fu students generally receive their black sash after a minimum of three years, according to the DC Shaolin website. Depending on the style of kung fu you are learning, acquiring a black sash might make you eligible to open your own school and teach the kung fu you have learned, which only inspires more scrutiny from teachers who are grading their students. Like many Japanese martial arts, such as iaido and judo, kung fu schools often have varying degrees of black sash that take considerable time to earn. Depending on your teacher and the type of kung fu you are learning, advancing from first-degree black sash to second-degree black sash might require the same amount of time it took to earn your first-degree black sash. 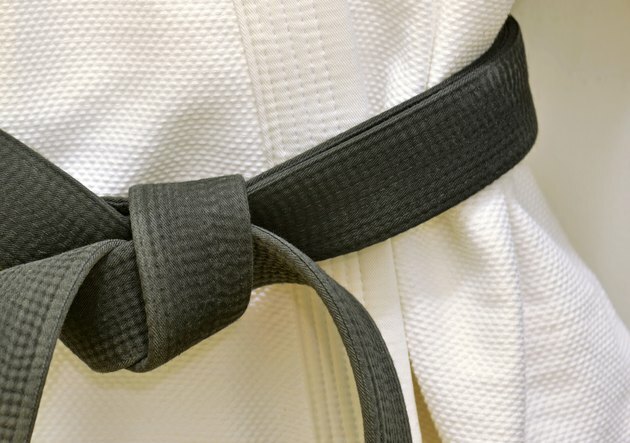 The forms, techniques and other requirements needed to ascend the ranks of black sash sometimes are kept from public knowledge and generally taught directly from master to student. Despite a student's eagerness and enthusiasm to progress in rank, the safest approach is to take time to effectively learn and master each individual form before requesting a grade advancement. As you ascend sash ranks, the forms and techniques that you learn become more physically demanding, increasing risk of injury if you have not developed proper muscle endurance from earlier forms. Talk to your doctor if you have previous injuries that might conflict with combat training, and when in doubt always ask your teacher for help.